In the Indian cement industry, capacity additions, particularly via mergers and acquisitions, have been a trend in the past few years. But in the wake of subdued demand growth, with higher capacity coming online, the industry’s capacity utilization consistently headed down (see chart 1). From peak levels of 86-89% in fiscal years 2007 to 2009 (FY07-09), all-India cement capacity utilization plunged to a multi-year low of around 65% in FY17, say cement industry analysts (see chart 2). Among regions, the southern market saw the strongest capacity growth and consequently the decline in capacity utilization was the sharpest, from around 79% in FY07 to just about 41% in FY16. Also, with lower utilization, the sector’s profitability fell sharply. 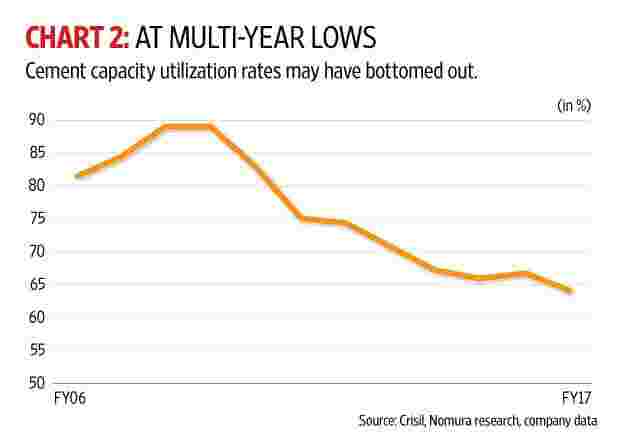 However, some analysts are of the view that capacity utilization rates have bottomed out and the cement sector is at the cusp of a cyclical upturn. They say that a revival in capacity utilization will be aided by falling supply growth and a likely pickup in demand. The pace of capacity addition is expected to slow, owing to stricter land acquisition rules and a revised limestone mining leases process, which requires mandatory auctions for allocation. “We expect the cement industry to enjoy a sustained recovery in utilization rates over the next five years. Utilization will rebound to more than 70% by FY20 and rising entry barriers (longer timelines to add capacity) will lift it to more than 75% over next five years," securities house CLSA said in a note. New capacity additions or expansions in certain pockets of the country are not ruled out. Sharing a similar view, a recent Nomura note said, “Given that current industry overcapacity remains high (current capacity of 420 million tonnes per annum, or mtpa, versus demand of 265 mtpa) and utilisation levels at multi-year lows, we expect capacity addition growth to remain subdued over the next few years. We assume capacity expansion of 50 million tonnes over the next three years till FY20F compared to 95 million tonnes over the previous five years." While a reduced pace of capacity addition may provide some cushion, robust demand growth is the need of the hour to better absorb incremental capacities. But looking at the current demand trends, there are no green shoots in sight of a significant demand revival in the near term. Also, there is not much clarity with respect to government spending given the revenue collection concerns and budget constraints. 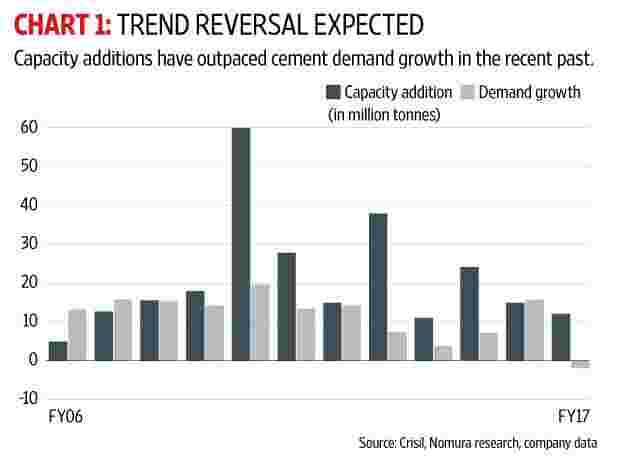 Further, even if there is a pickup in demand from the housing segment, which contributes nearly 65% to total cement demand, it may not be adequate to push cement demand higher from the present levels of 4-5%, fear some analysts. On 28 September, rating agency Icra trimmed its cement demand forecast for FY18 from 5% to 3.5–4% owing to the delay in the revival of cement demand during the first half. It expects demand to rebound from the third quarter of FY18 onwards, buoyed by road and irrigation projects. Meanwhile, cement prices across India remain weak, hampered by lacklustre demand. For prices to remain on a firm footing, not only capacity additions have to slow down, but at the same time, demand has to increase significantly. However, the chances of these factors playing out together look bleak in the near term.